DES MOINES, Iowa -- With the country still reeling from deadly terrorist attacks in Paris, Hillary Rodham Clinton cast herself as America's strongest leader in a scary world, even as she found herself forced to defend her own role during the rise of the Islamic State militants. "This election is not only about electing a president, it's also about choosing our next commander in chief," Clinton declared Saturday night in the Democrats' second debate of the presidential campaign. "All of the other issues we want to deal with depend upon us being secure and strong." Clinton defended her relationship with Wall Street, citing her work in the aftermath of the Sept. 11, 2001, attacks, but her statement met with criticism from Republicans who accused her of politicizing the terrorist assaults. Since the Democrats' first debate a month ago, Clinton has built a lead in the early voting states, gains that have come amid other signs the party is coalescing behind her. But the nomination fight is far from over. 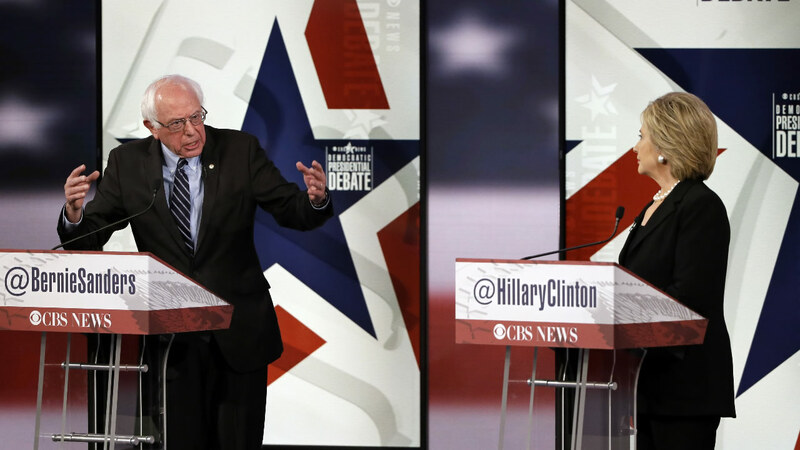 Saturday night, Clinton faced criticism of her national security record, when Sanders traced the current instability in the Middle East to the U.S. Senate's vote - including Clinton's - to authorize military action in Iraq in 2002. He said that U.S. invasion "unraveled the region." The former secretary of state fought back, saying terrorism has been erupting for decades, specifically mentioning the Sept. 11 attacks. She said the recent unrest in Libya and other parts of the Middle East is symptomatic of an "arc of instability from North Africa to Afghanistan." All the candidates denounced the attacks, and the debate began on a solemn note with a moment of silence followed by the previously unplanned foreign policy questions. The conversation later pivoted to economic issues, with the candidates tangling over how to pay for their plans to expand college affordability, family leave and prescription drug coverage. The conversation revealed how Sanders' message has helped shift the party to the left on some economic issues. All three agreed that wealthy citizens and corporations should pay more in taxes to benefit the middle class. They tangled over how high to increase the minimum wage, with Clinton backing a $12-per-hour federal floor while Sanders and O'Malley said $15 an hour - the rate being pushed by a campaign of fast-food workers and labor unions. And they fought over the degree to which they would curtail large financial institutions, with Sanders describing Wall Street's business model as "greed and fraud" - a startling judgment for a major presidential candidate. While Clinton is wary of alienating Sanders backers whose support she'll need should she win the nomination, she did take a few shots. She attempted to cast some of Sanders major proposals, including a single payer health care system and free college, as politically unrealistic. "The revolution never came," she said, in a knock on his call for a "political revolution." ''I waited and I got the scars to show for it." Sanders may have inadvertently helped her in the first debate, when he seemed to dismiss the controversy over her use of a private email account and server by saying Americans are tired of hearing about her "damn emails." Saturday night, Sanders declined once again to attack: "I am still sick and tired of Hillary Clinton's email," he said.